In some of the top shows this season, costume designers made the political personal. When a show is steeped in politics and culture, costumes are the swiftest path to communicating what’s at stake. In “The Crown,” the wardrobe of Queen Elizabeth II (Claire Foy) expresses her rite of passage inside and outside the palace; in “The Handmaid’s Tale,” red dresses symbolize menstrual blood and political rage; in “American Gods,” costumes express the battle between the Old and New Gods; in “Feud,” wardrobes underscore the bitter rivalry between Joan Crawford (Jessica Lange) and Bette Davis (Susan Sarandon); and in “Hairspray Live!,” the flamboyant costumes help unite Baltimore during the civil rights movement of the ’60s. 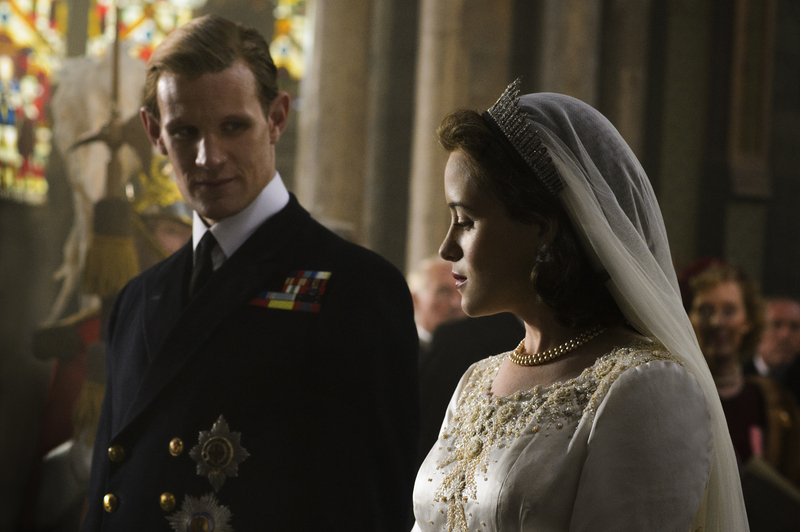 The wedding and coronation dresses offered distinct challenges for costume designer Michele Clapton (three-time Emmy winner for “Game of Thrones”). Authenticity, particularly the iconic silhouette, was important for the wedding dress, as was a comfortable fit for Foy as Elizabeth. “We altered it around the arms slightly because it was a little too full on Claire,” Clapton said. But in researching the cloth and the intricate beading, Clapton discovered that fabric doesn’t come as wide as it did back then, so the train wound up about three inches shorter. That alone took six weeks to complete with its own dedicated teams of embroiderers and beaders. The coronation dress, meanwhile, was created using white silk satin embroidered with the emblems of the UK and the Commonwealth. At Elizabeth’s insistence, there was a new design in the newly made purple Robe of Estate. And the embroidered cipher and border of wheat ears and olive branches took 35 hours to complete. Together, the outfits began to tell a deeply personal story about a very relatable Queen. 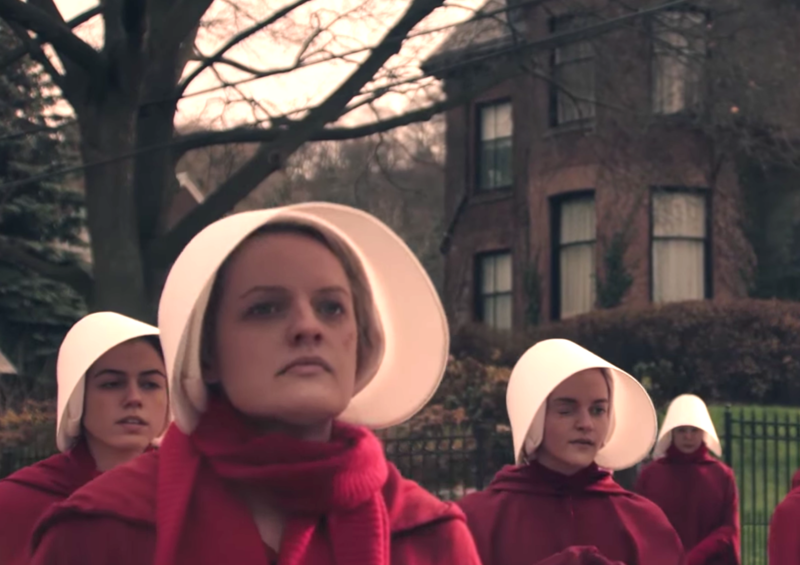 In Reed Morano’s adaptation of Margaret Atwood’s color-coded dystopia, the gray, muted look of Gilead stands in sharp contrast to the vivid dresses. And most striking is the red of the handmaids. Distinguishing the Old and New Gods in the adaptation of Neil Gaiman’s fantasy saga was most important to costume designer Suttirat Larlarb. Old Gods fear being forgotten, while New Gods are into rebranding. 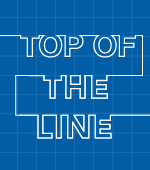 The battle for supremacy is about staying relevant in modern times. Technical Boy (Bruce Langley), the New God who fears obsolescence, looks bizarre in a white stretch limo with a forced perspective reverberating in his costume (thanks to the fluorescent red triangular patterns on his shirt). 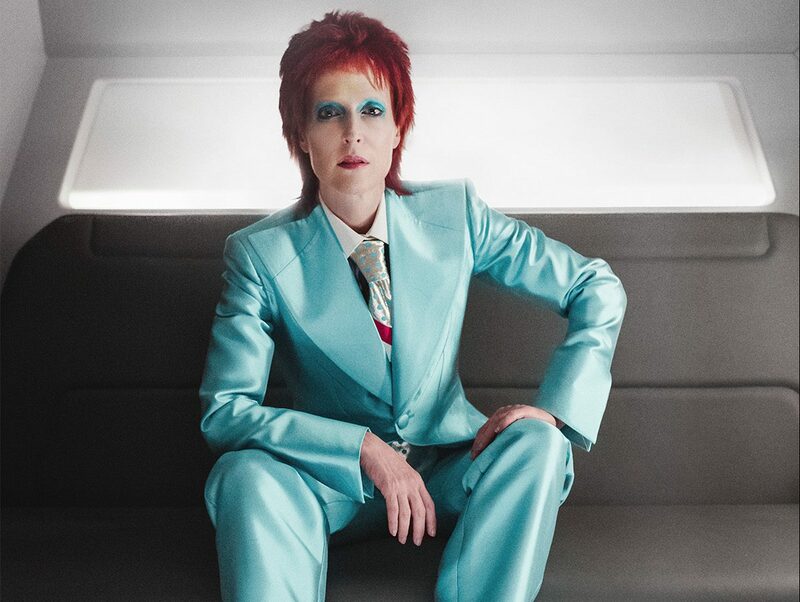 In that same limo, Media (Gillian Anderson), dressed as David Bowie’s Ziggy Stardust, has an electric aura, and the two Gods play off each other’s androgyny. Old Hollywood had a tough time staying relevant in the ’60s, exemplified by the fierce competition between Crawford and Davis in “Whatever Happened to Baby Jane?” Three-time Emmy-winning costume designer Lou Eyrich offered a great study in contrast, following the silhouettes in each movie star. Crawford always wore cool icy tones set against the warm, autumnal colors of Davis. But replicating the wardrobes they wore in the black-and-white “Baby Jane” proved difficult because there were no color photographs to reference. So Eyrich did a lot of color guesswork while matching fabrics and trims and keeping the silhouettes constant. As for the infamous ’63 Oscars, where Crawford upstaged Davis (nominated for “Baby Jane”), the hardest part was sourcing vintage fabrics. Edith Head designed Crawford’s head-turning beaded dress, and Eyrich not only matched the fabric and dye it, but also had it hand-beaded at an affordable price. 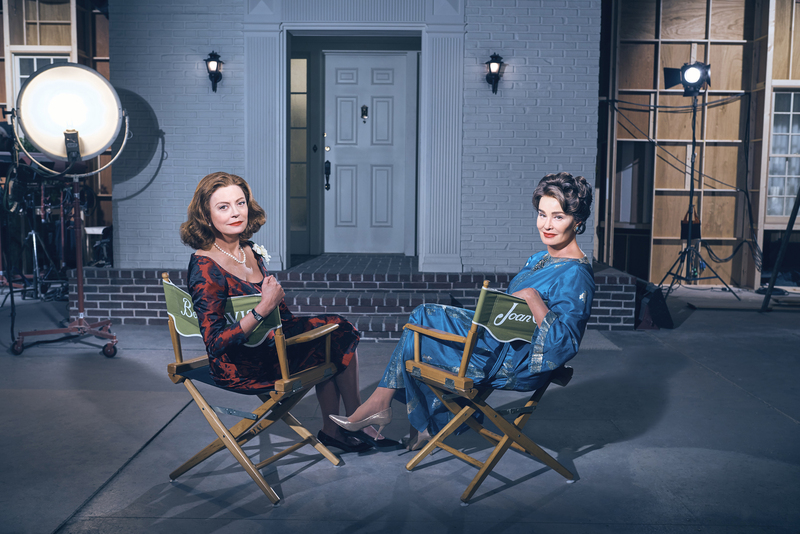 Costume designer Mary Vogt learned quickly about creating a heightened reality for a live TV broadcast. That meant amping up early-’60s fashion. With the camera right up on the actors, though, the costumes needed to be brighter but still big. “We couldn’t make too many mistakes, and I was worried about people ripping their clothes. We overbuilt the clothes so they’re really strong, and made the men’s clothes out of stretch fabrics,” Vogt said. 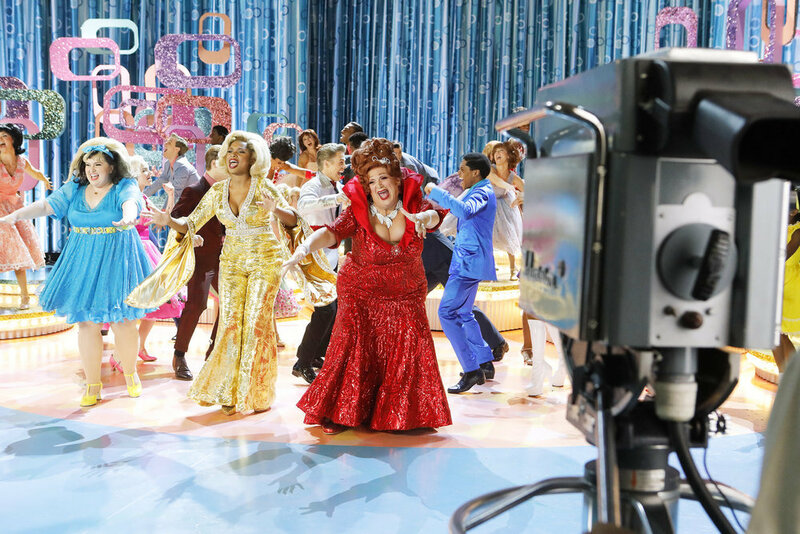 Vogt had a go-to person in Harvey Fierstein (who reprised his Tony-winning role as Edna Turnblad and adapted the NBC show). “Our [Edna] dress didn’t have the soft blues, which work really well on stage, and I wanted more vibrant colors because we were shooting at night.” So Vogt went with burgundy and had it covered in crystals so that it sparkled. This gave the outfit a life of its own.